Inflation happens when there is a continuous increase in the price level. Predictably, high rates of inflation create uncertainty and wipe away the value of savings. However, a low inflation rate of about 2 percent is beneficial, and most Central Banks target it. During periods of economic stagnation, some economists suggest that we target a higher rate of inflation. This is because it has its advantages as well as disadvantages. Adjustment of wages – moderation inflation makes wage adjustment possible. People argue that a moderate inflation rate makes it easier for them to adjust to relative wages. For instance, cutting nominal wages might be difficult, but if average wages go up due to moderate inflation, it would be easier to raise the wages of productive workers. If there was zero inflation, there could be real wage unemployment, which means that firms would not be able to cut wages to attract workers. Deflation – negative inflation is very harmful. When there was a prolonged period of negative inflation in Japan, their government suffered lower growth due to deflationary pressures. When prices fall, people are afraid of spending money because they fear that the prices will drop further in future. Moreover, deflation raises the real value of debt and lowers the disposable income of people who are struggling with debts. 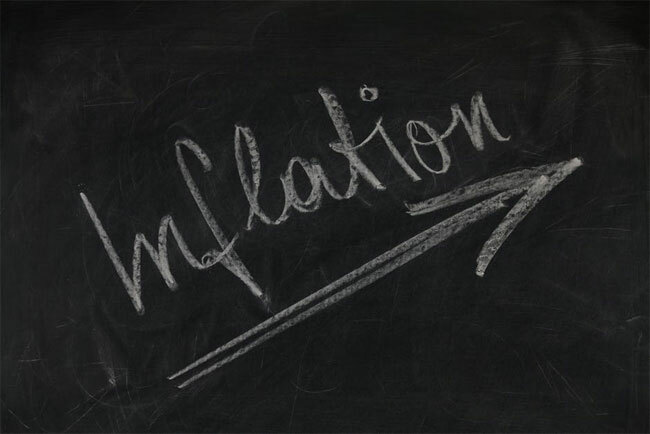 Inflation boosts growth – at times when inflation rates are very low, the economy is stuck in a recession. Therefore, targeting a higher inflation rate can facilitate an increase in economic growth. However, this perspective is controversial, and not all economists would advise targeting a higher inflation rate if the economy is stuck in a prolonged recession. Adjustment of relative prices – just as with wage adjustment, moderate inflation makes the adjustment of relative prices easier. This is important for a single currency zone such as the Eurozone. Countries in Southern Europe such as Greece and Spain became uncompetitive, which led to a huge current account deficit. Since Greece and Spain can’t devalue in the single currency, they usually cut relative prices to win back competitiveness. With very low rates of inflation in Europe, this means that they have to cut wages and prices, leading to lower growth. If the Eurozone had moderate inflation, Southern Europe would have an easier time adjusting and regaining competitiveness without resorting to deflation. Inflation becomes problematic when the rate of inflation rises above 2 percent. The higher the inflation is, the more serious the issue is. Hyperinflation can wipe away people’s savings and lead to significant instability. Think about Zimbabwe in the 2000s when they had notes of 100 trillion Zimbabwe dollars. Fall in real wages – high inflation rates can lead to a fall in real wages. When inflation is higher than nominal wages, the real incomes will fall. Reduces the value of savings – it causes a fall in the value of money. This means that as a saver, you will be worse off if the rate of inflation is higher than the rate of interest. High inflation might cause a redistribution of income in society. In most cases, pensioners lose the most when inflation is high. Uncompetitive economy – inflation tends to make the economy uncompetitive. For instance, high inflation in Italy can make Italian exports uncompetitive, which leads to lower economic growth, lower AD, as well as a current account deficit. This is especially important for countries that are in the Eurozone since they cannot devalue to bring back competitiveness.